Sumaki-kamaboko or simply sumaki are fish strips made from surimi fish paste. It is most common to be eaten with soy sauce. 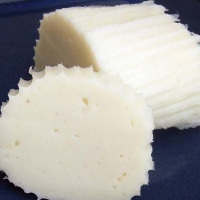 It has relatively the same amount of protein and fat content as kamaboko. However, kamaboko wrapped with konbu seaweed has more calories. The calories in Sumaki-kamaboko per 150g(1piece) is 135 calories. Sumaki-kamaboko is calculated to be 90Cal per 100 grams making 80Cal equivalent to 88.89g with 18g of mostly protein、13.05g of carbohydrates、1.2g of fat in 150g while being rich in vitamins and minerals such as Sodium and Vitamin B12.